In recent years, the use of black cohosh (Actaea racemosa syn. Cimicifuga racemosa) has focused on its potential to relieve hot flashes associated with menopause. This is due to the content of phytoestrogens in the roots. The AHP monograph provides a comprehensive review of the clinical and preclinical studies supporting its effects. Many of these studies were translated from original German research never before available in English. 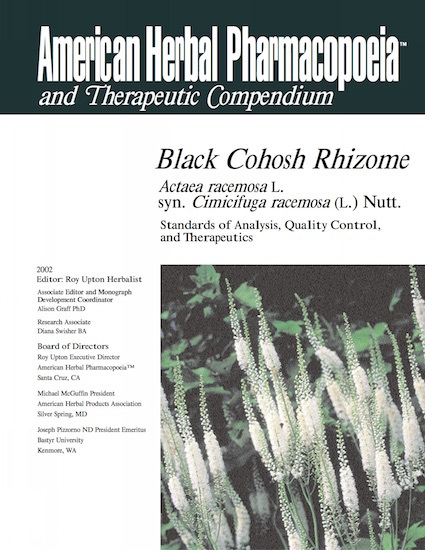 Of specific interest to many, is the monograph’s coverage of the controversy concerning black cohosh’s potential estrogenic activity, its appropriateness or inappropriateness in those with a history of breast cancer, its use in pregnancy, and its interaction with conventional medications such as tamoxifen (for a detailed discussion on phytoestrogens, see AHP’s Red Clover Monograph and Therapeutic Compendium). In addition to its use in menopause, black cohosh has been historically considered one of the most effective herbs for the relief of neuralgic and rheumatic pains, so much so that a common name was rheumatism weed. It is unfortunate that botanicals get limited to specific indications by market pressures. There are considerable identity and adulteration issues that exist on the world market for black cohosh. It is very common for Asian species to be traded as “black cohosh” but only the North American Actaea racemosa can be marketed by this name. Adding to the challenge is that Asian black cohosh is often adulterated with another species of herb known as Serratula. Moreover, adulteration with other species has led to concern regarding the potential for hepatotoxicity of purported black cohosh supplements. This has never been a recorded concern with authentic black cohosh, making it imperative to know how to differentiate the correct and adulterating species.